As Australia’s second largest private sector employer and New Zealand’s largest private sector employer, Woolworths makes a considerable contribution to employment and the economy. In Australia, Woolworths employed, in 2015, 197,426 people, including 74,848 young employees under the age of 25 years. 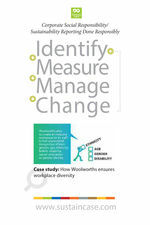 Workforce diversity is thus a top priority. 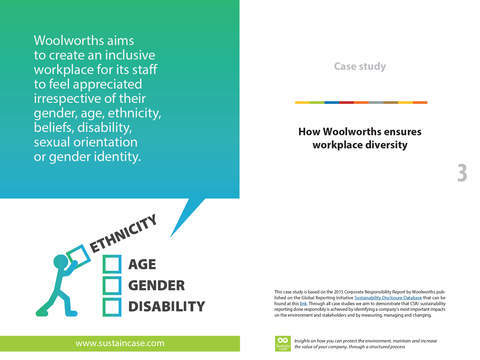 improvement and hotels, Woolworths aims to create a lively and inclusive workplace for its staff to feel appreciated at work irrespective of their gender, age, ethnicity, beliefs, disability, sexual orientation or gender identity. 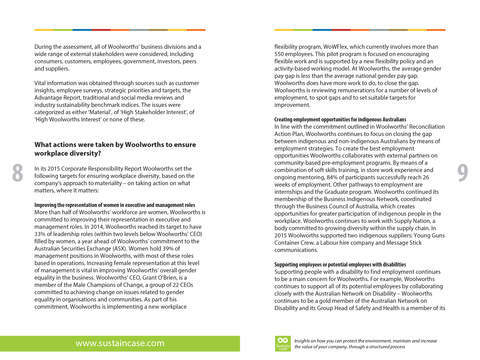 After measuring and setting targets, Woolworths took action to improve the representation of women in executive and management roles – in 2014, Woolworths reached its target to have 33% of leadership roles (within two levels below Woolworths’ CEO) filled by women –, create employment opportunities for indigenous Australians, support employees (or potential employees) with disabilities – Woolworths continues to support all of its potential employees by working closely with the Australian Network on Disability to ensure its new recruitment system is disability friendly – and, also, promote age diversity.